KFC is currently being talked about in the United States, no longer because the product is busy talking about, but because the ads have been aired on TV and its youtube channel. 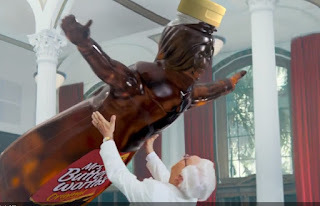 The advertisement shown shows the intimacy between Colonel Harland Sanders and Mrs. Butterworth. In the ad, Craig Fleming, the actor acting as Colonel Harland Sanders and Mrs. Butterworth, which is a bottle of syrup, is an intimate scene, both of which should be as good as a lover who has just met. The scene shown is when Mrs. Butterworth approached Colonel Harland Sanders and surprisingly they were found to be feeling first glance. The most memorable thing was when there was a back sound by Celine Dion entitled "I'm Your Lady", they did a scene that made the audience feel funny or something strange. They had a kiss scene like a lover who had been reunited for a long time. The Colonel gently caressed his cheek and then the syrup bottle Mrs. Butterworth leaned on him. But after they finished the scene of the KFC product pop-up, which was named Kentucky Fried Chicken & Waffles, there was a sprinkling of syrup flowing over the waffles. Syrup sprinkled on top of the waffles was made by Mrs. Butterworth, which one is Mrs. Butterworth is one of the most famous syrup and pancake maker companies. Both of them support each other in making the latest KFC ads this year. This advertisement is a quite intriguing discussion among the American community and makes many KFC loyal customers who want to try again the Kentucky Fried Chicken & Waffles menu. A director who arranged the scene got a brilliant idea, both of which (Colonel Harland Sanders and Mrs. Butterworth) had a scene like a married couple. This is a scene that invites a lot of laughter by loyal connoisseurs of the KFC menu because indeed Mrs. Butterworth is a fictional shop actor who is a temporary syrup bottle (Colonel Harland Sanders is the initial founder of the KFC company. Do you want to try it? Please search for the nearest KFC store in your area. Colonel Sanders or Harland David Sanders Born: September 9, 1890 and died on December 16, 1980. Born and raised in Henryville, Indiana. Colonel Sanders passed several professions in life, with varying success. Colonel Sanders sold fried chicken made in 1930 in the midst of the Great Depression. at a gas pump owned by Corbin North a small town on the edge of the Appalachian Mountains south east of Kentucky. The dining room was named Sanders Court & Café, which was fairly successful and he was given the honorary title of the Kentucky Colonel in 1936 by the Governor of Kentucky Ruby Laffoon. The following year the restaurant expanded to 142 seats and he began adding a motel that he bought across the street. When Sanders prepared his original chicken restaurant in North Corbin, he served chicken in an iron skillet, which took about 30 minutes to cook (but too long for restaurant operations). In 1939, Sanders changed the cooking process of his fried chicken and used Pressure frying. so that when cooking it is greatly reduced compared to fried. Not only does it increase the speed of production, but the method produced by flakier, moisturizes the chicken. Between 1939 and 1940, Sanders also designed what came to be known as the Original Recipe, from 11 spices. In 1940 he completed the Original Recipe 11 herbs and spices. Sanders used salt and pepper for the recipe, from the ingredients used then Sanders was recommissioned (new commission) as the Kentucky Colonel in 1950, by Governor Lawrence Wetherby. since then dressed with his trademark. 0 Response to "KFC Commercial With Mrs. Butterworth"